So, today in Knitting and Crochet Blog Week is all about colour (search 4KCBWDAY4 to find more colourful posts). My favourite colours generally are blue, green and purple. 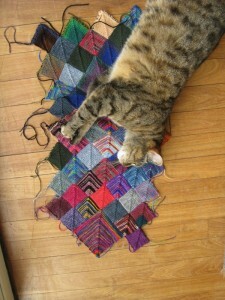 A lot of my knitting tends to follow those colours, particularly if I want to wear it. However, I’ve had quite a lot of yarn given to me, or via sock yarn clubs, so I do have in my stash quite a wide variety of colours. Last year, on looking through my socks, I realised a gap in my colour range. I had no pink socks. Now, given that I dislike pink, this shouldn’t be a problem, but I am a priest in the Church of England and one of my secret geekish traits is to match my hand-knitted socks on Sundays to the colour of the vestments for the day. On the third Sunday in Advent and the fourth Sunday in Lent, traditionally, this means pink, so I must have pink socks. I haven’t completed them, but I’m working my way up the leg. 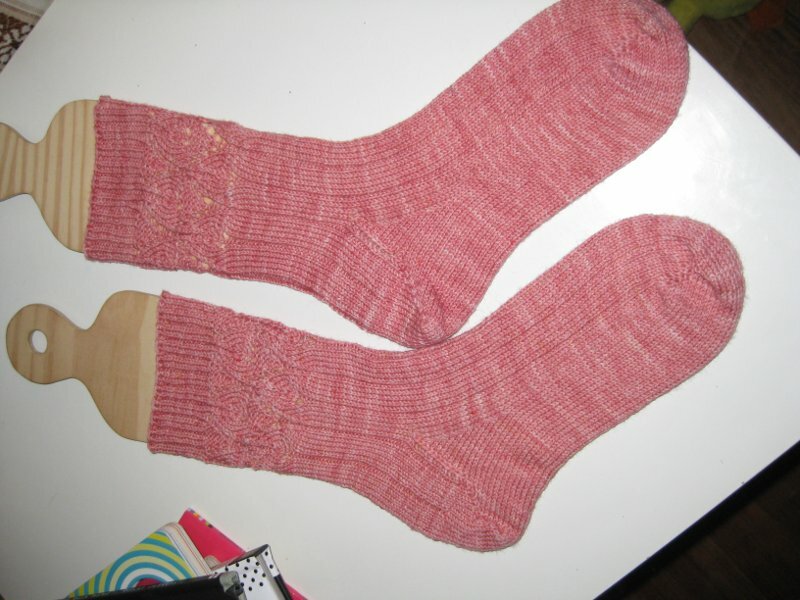 Looking back at the year, I see that I have already knitted two pairs of pink socks – both to be given to other people. 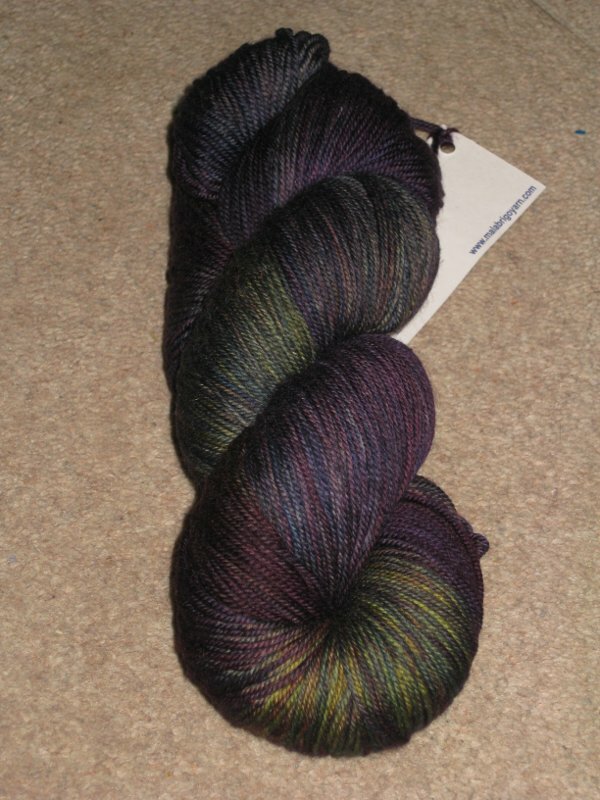 I’ve tried rainbow yarn and a few shades of grey, but otherwise I’ve stayed fairly well within my comfort zone. The very pink-looking one on the top row (third along from left) will look much less pink when finished – it is just the edging that is pink, the rest is grey-ish (with flecks of many other colours). No, I don’t think I can find anything monkeyish about these colours. 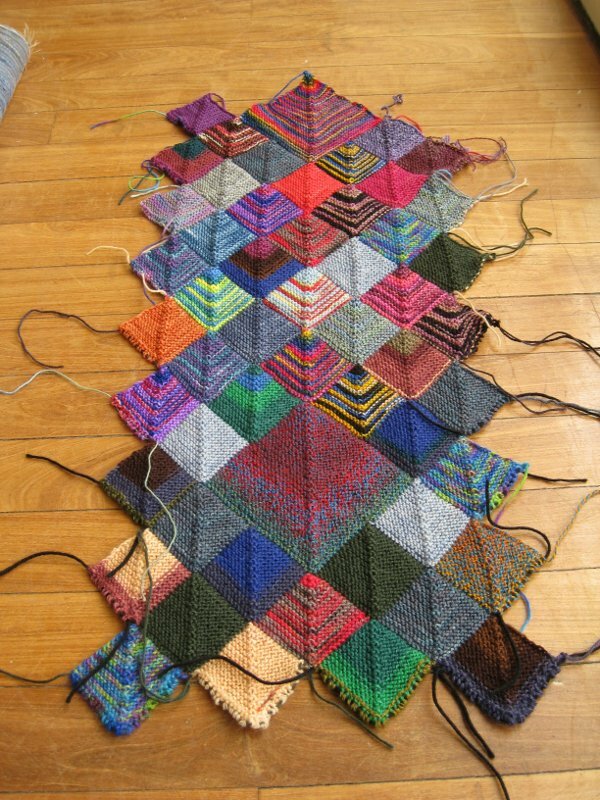 I’ll finish with an update on my ongoing mitred square scarf. Can you tell the colour rules I’m following in placing the squares? I had help with the photoshoot. 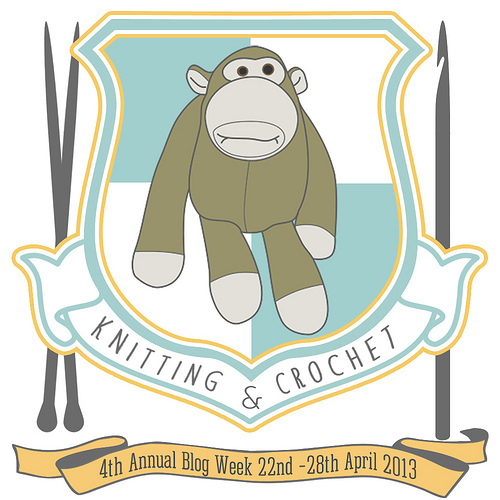 So, here we are with Day 1 of the Fourth Annual Knitting and Crochet Blog Week (search for 4KCBWDAY1 to find the other participants). Welcome, if you haven’t been here before. 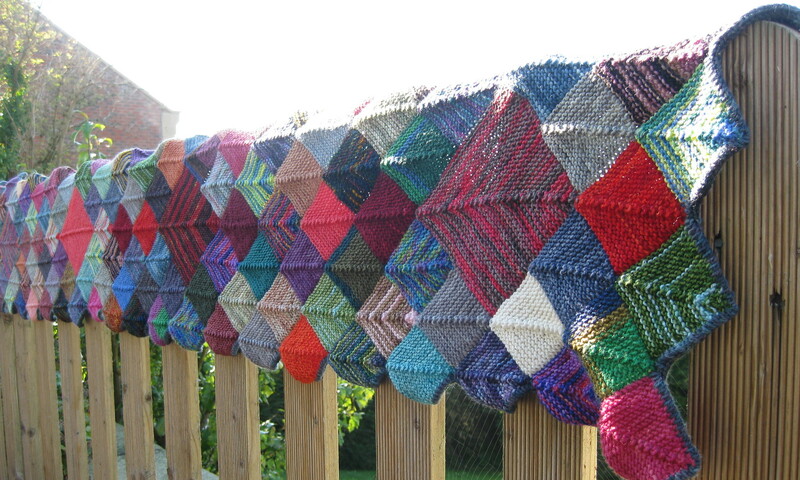 The challenge today is to declare your house and explain what sort of knitter/crocheter you are. The four houses are Bee, Monkey, Manatee and Peacock, each with their own attributes. See eskimimi’s post about all four for more details. Looking at the four houses, with their badges, I instantly wanted to be a bee or a peacock because I loved the look of their crests. 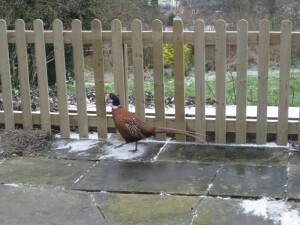 However, peacocks are all about the finishing, adding sparkle and pretty touches to make something unique. When I finish something, I want it out of the door and on to the next thing straight away. Bees, on the other hand, have low concentration levels and flit from one thing to another. Let’s be honest, we all have days like that, but I don’t think it is my primary mode of operation. I tend to queue up possible next projects and let them marinade for a while before casting them on. Any day now I’ll be casting on a Color Affection shawl – so last summer, but I’ve had other things on the go. It came down to manatee or monkey. Manatees love the relaxing part of knitting and, while I do see the value in settling down for a relaxing afternoon of garter stitch and a film on tv, that isn’t the reason I knit. 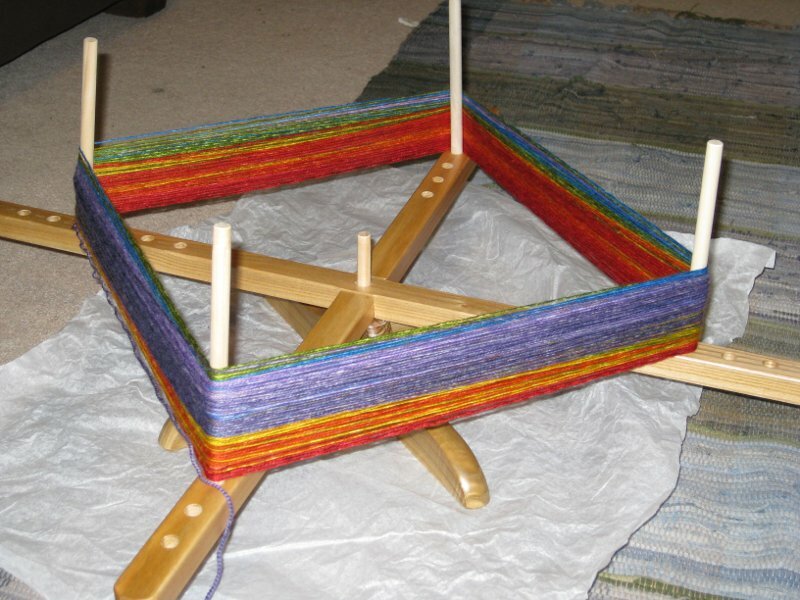 I knit to learn new things, conquer difficult challenges and keep interested in what is happening in the fabric in front of me. Monkey it is then. I’m writing these posts in advance and scheduling them to appear because my hours of work at the moment are a little crazy and who knows what I’ll be doing on Monday morning. I’ve set aside a whole day for knitting, it’s mid-afternoon and I’ve not yet picked up the needles, but I’m feeling as if I have spent the day knitting. 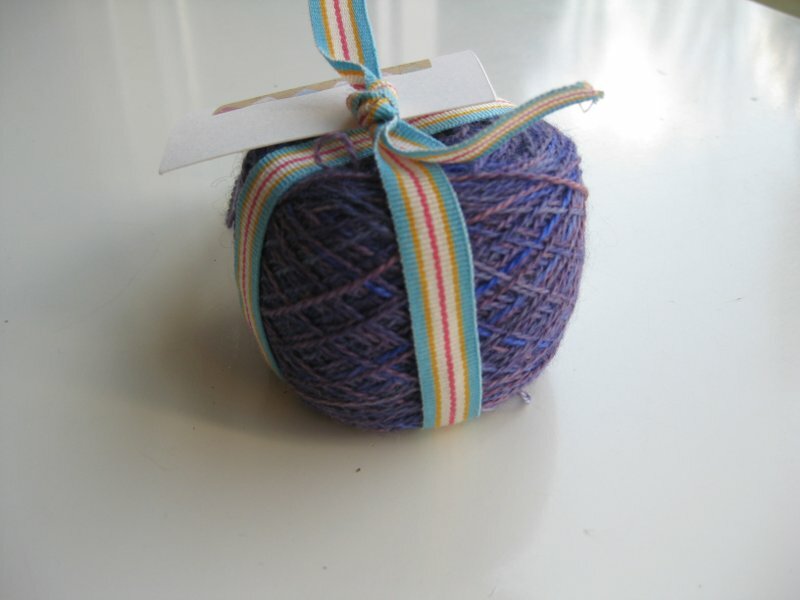 I like to think things through, so I was thinking about knitting in the bath this morning, I’ve been reading some books on knitting, I’ve caught up on some knitting blogs and now I’m writing. I love the challenge of thinking through a pattern and figuring it out properly. Socks are my usual learning tool. 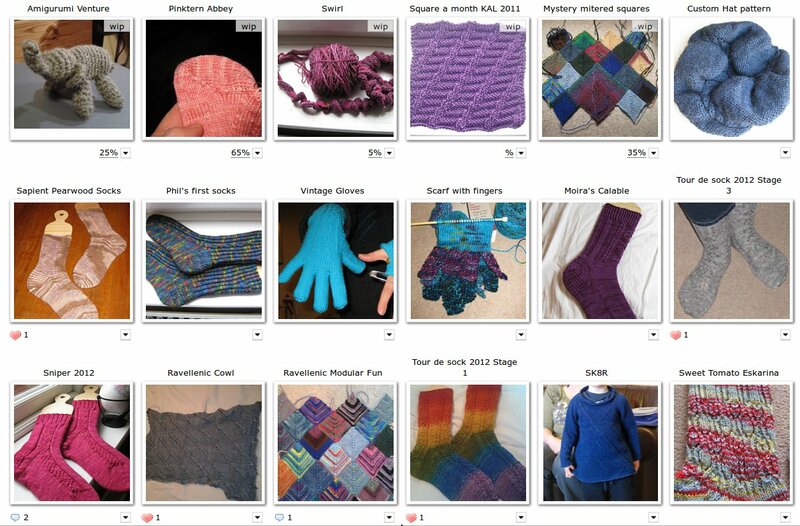 According to my ravelry profile, I’m knitting my 32nd pair of adult socks and they’ve all taught me something. My first project when I came back to knitting was a simple pair of top-down socks, all in stocking stitch, with a heel-flap. I don’t think I have ever knitted another pair like that. I’ve done toe-up, many different heel constructions, colour work, lace, cables, beads and plenty else. 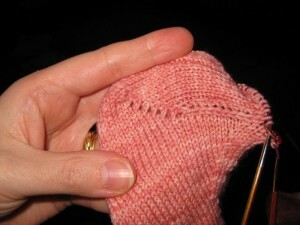 I’m not done knitting socks yet either. 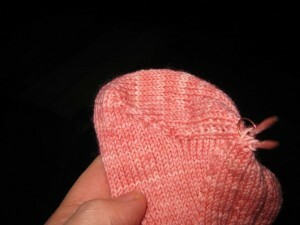 my current pair – Tintern Abbey by Brenda Dayne – have included learning the Sherman method for toes and heels. I found the instructions an absolute swine to follow, but got there in the end. I even ripped a heel back twice in order to get it right. This is progress, since I’m normally too stubborn to redo things and will just knit on and make things work . 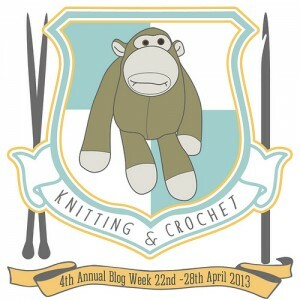 That was Day 1 of Knitting and Crochet Blog Week. Do leave a comment with a link to your blog. I’m always interested in adding new feeds to my reader. More tomorrow. 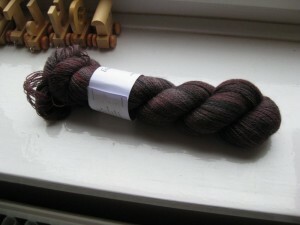 Tomorrow sees the start of Knitting and Crochet Blog week but, before that gets under way, there are a few items to blog. Remember the Woolly Wormhead hat workshop I went on a while back? Well, I finished the hat. 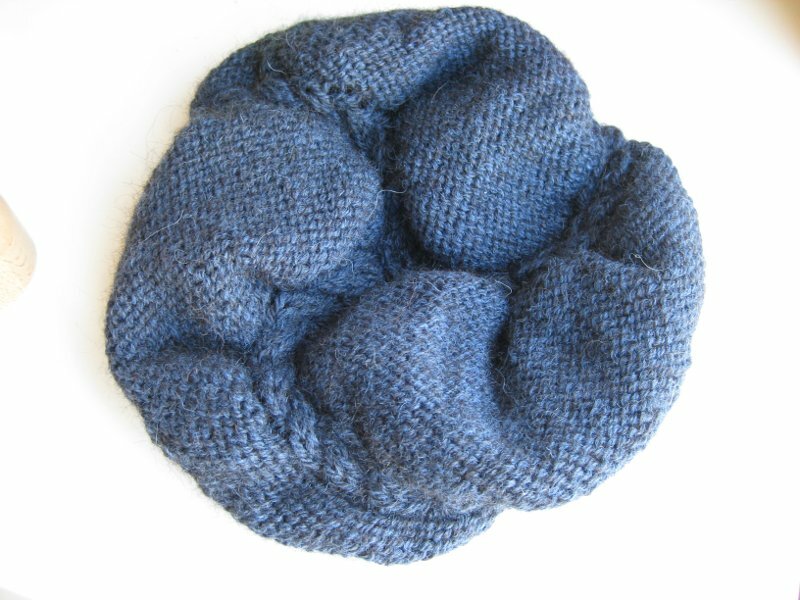 It’s a beret with three spirals on it. 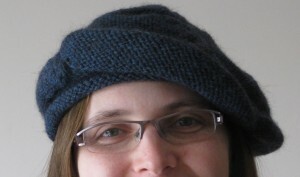 The spirals rather pull the beret out of shape, but it’s a good basic hat. This is the first hat I’ve made that actually fits nicely round the crown. Thanks Woolly, for the handouts and the theory of hats. The pink socks are coming along nicely, but you’ll be hearing more about that later in the week. 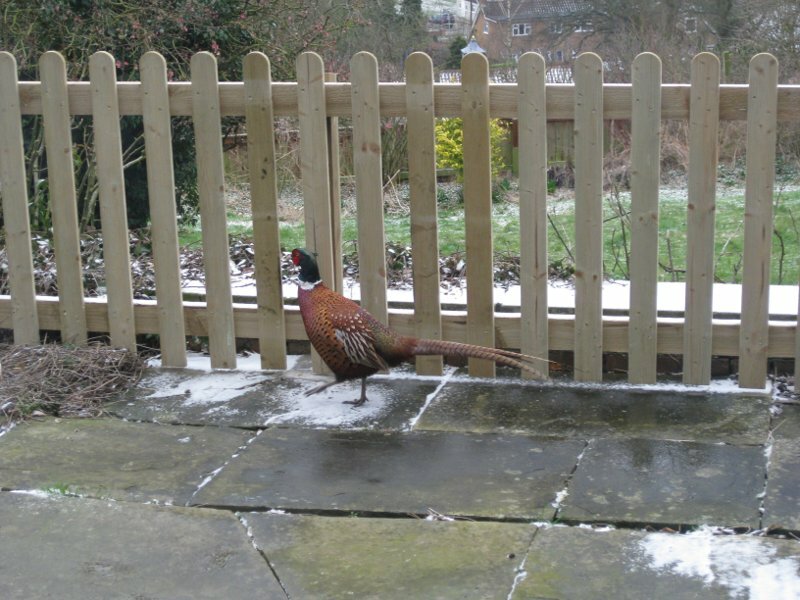 On the edge of the terrace, (not as grand as it sounds), in the back garden we’ve had a really long fence put up to stop the small children jumping off and injuring themselves. 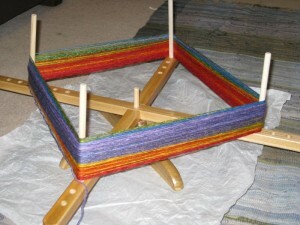 As soon as I saw it I thought that it had potential for displaying knitting. The new header is a first attempt at using the fence. I’m sure there will be more in the future.